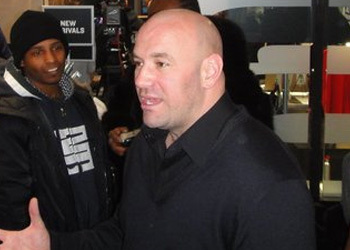 Although the UFC’s contract with Spike TV will expire at the end of 2011, Octagon president Dana White said his decision to air Saturday’s “UFC 125 Prelims” on ION Television had nothing to do with their ongoing negotiations with the network. “Absolutely nothing,” White emphatically stated following Wednesday’s press conference. “Spike TV was offered these. They can’t take them. They’re not taking them. UFC.com offered a free stream of “UFC 124 Prelims.” The “2010 Video Game Awards” prevented Spike from opening for Georges St-Pierre that night, however there is no such ceremony this Saturday. In fact, viewers of the edgy network will be halfway through “The Longest Yard” by the time Ion’s New Year’s Day extravaganza kicks off. Since the Adam Sandler’s presence was in such high demand, White was forced to look elsewhere to get his product to the people. Although Ion is currently available in more than 100 million homes, White was noncommittal when asked if this was a one-and-done for ION. UFC 125 takes place Saturday inside the MGM Grand Garden in Las Vegas, Nevada.